Here are this week's best match-ups at Kroger! --Chef Boyardee pasta - $0.88. --Lean Cuisines - 5/$11. Use $1/4 (SS). Final Price: $1.95 each when you buy 4. --Gatorade or G2 - $0.79. --Kroger bread or buns - 10/$10. --Barilla Pasta - 10/$10. Use $075/2 (SS). Final Price: $0.63 each when you buy 2. --all Liquid Detergent - $2.99. Use $1 off (SS - expires 6/2). Final Price: $1.99. --Snuggle - $2.99. Use $0.50 off (RP) which doubles to $1. Final Price: $1.99. --Kraft Easy Mac or Velveeta Shells (singles) - 10/$10. --Aquafresh toothpaste - 10/$10. Use $1/Advanced Whitening or $0.50/Extreme Clean (aquafresh.com) which doubles to $1. Final Price: FREE. The following items are part of the 4-Day Sale. Prices are good through Sunday. --7-Up 2 Liters - $0.88. --Kroger Large Eggs - $0.88. --Tony Pizzas (singles) - $0.88. --Popsicle Frozen treats - $0.88. Use $1/Yosicles (SS). Final Price: $0.22 MONEYMAKER! --Nabisco Snack Crackers - 3/$5. Use $1/2 (smartsource.com). Final Price: $1.17 each when you buy 2. --General Mills Cereals - 3/$5. Use $1/3 or $1/2 Select Cheerios. Final Price: as low as $1.17. --Betty Crocker fruit snacks - 3/$5. Use $0.50/2 (smartsource.com) which doubles to $1. Final Price: $1.17 each when you buy 2. --Hershey candy - 2/$6. Use $1/2 (SS - expires 5/31). Final Price: $2.50 each when you buy 2. 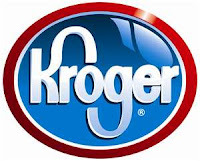 If you can hit up your Kroger before Sunday, you can definitely snag some really great deals! I'll post any other finds that may pop up! I can not express how excited I am to turn off my alarm tonight and allow my son to be my alarm for the next 8 weeks. Between tying things up for the last days of school and an inspection on our new house, today has been a busy one! But have no fear! Here are this week's Meijer match-ups! --Yoplait yogurts - 10/$6. Use $0.40/6 (smartsource.com) which doubles to $0.80. Final Price: $0.47 each when you buy 6. --Pillsbury Crescent rolls - 3/$5. Use $0.40/3 (SS) which doubles to $0.80. Final Price: $1.40 each when you buy 3. --Dole fruit bowls (4 pk) - 5/$10. Use $0.50/2 (SS) which doubles to $1.00. Final Price: $1.50 each when you buy 2. --Wishbone dressing - $1.99. Use $0.25 (RP) which doubles to $0.50. Final Price: $1.49. --Hellman's mayonnaise - 2/$6. Use $1 off (RP). Final Price: $2. --Marzetti dressing - 2/$4. Use $0.50 off (SS) which doubles to $1. Final Price: $1. --Twizzlers - 3/$9. Use $1 off (SS 5/20). Final Price: $2.67 each when you buy 3. --Pringles - 2/$3. Use $1/4 (SS). Final Price: $1.25 each when you buy 4. --Capri Suns - 2/$4. Use $0.75/3. Final Price: $1.75 each when you buy 3. --Nestle Pure Life water - 3/$10. Use $1/2 (RP). Final Price: $2.83 each when you buy 2. --Kool-Aid packets - 15/$2. Use Buy 10 get 5 Free (RP). Final Price: $0.20 each when you buy 20. --Sobe Life Water - 5/$5. --Tide - $5.99. Use $0.25 off (May PG - expires 5/31) which doubles to $0.50. Final Price: $5.49. --Bounty paper towels - 2/$7. Use $0.25 (May PG expires 5/31) which doubles to $0.50. Final Price: $3.00. --Valley Fresh canned chicken - 2/$4. Use $1/2 (SS) and $1/2 mPerk. Final Price: $1.00 each when you buy 2. --Hershey's Drops - 3/$8. Use $1/2 (SS - expires 5/31). Final Price: $2.17 each when you buy 2. --Nabisco Wheat Thins or Snack Crackers - 2/$5. Use $1/2 (smartsource.com). Final Price: $2 each when you buy 2. --Keebler Club or Town House crackers - 2/$4. Use $1/3 mPerk. Final Price: $1.67 each when you buy 3. --Oscar Meyer hot dogs - 2/$3. Use $0.75/2 Oscar Meyer Selects (SS). Final Price: $1.13 each when you buy 2. --Clean and Clear products - Buy 1 Get 1 50% off. Use two $1 (SS). Final Price: varies. --Yoplait Greek Yogurt - $0.89. Use $1/3 mPerk. Final Price: $0.57 each when you buy 3. --Red Gold canned tomatoes - 2/$3. Use $1 off mPerk. Final Price: $0.50. --Select Desitin or Johnson baby products - 15% off. --Buy 1 Pampers Super Pack Get a $7 Meijer gift card. Use $1.50 off (coupons.com) or $1 off (May PG - expires 5/31). Final Price: varies but this could get a GREAT deal for diapers! I'll get prices tonight!! --Buy 2 Pampers Easy Up packs and get a $5 Meijer gift card. Use $1/2 (May PG - expires 5/31). Final Price: varies. --Meijer jumbo pack diapers - $5.99. --Meijer Little Meals or Snacks - 2/$3. --Huggies or Pampers wipes (3x refill) - $5.79. Use $0.50 off Huggies (SS 5/20) which doubles to $1 or $0.75 off Pampers wipes (coupons.com). Final Price: as low as $4.79. --Gerber Yogurt Blends or Breakfast Bars - 2/$5. --Beach-Nut Stage 2 jars - $0.44. --Buy 2 Similac formulas and get a $5 Meijer gift card. Final Price: varies. I'm heading over now to grab somethings with my coupons that expire today! I'll post unadvertised finds tomorrow after my bi-weekly trip! HOT coupon for $1 off Huggies new Hawaiian diapers -- oh so cute! This is always one of those coupons I print and file away because CVS or Walgreens ALWAYS has great stock up deals on Garnier hair products! Print away my friends, before it's too late! This coupon is definitely a print-and-file-away one! If your store doubles, you can snag these bottles of Newman's Dressing for around $1 when on sale! Fisher Price's Laugh and Learn Love to Play Puffpy is on sale this week for $19.99. Stack this sale with the Target coupon and the manufacturer coupon and you've got a STEAL on this toy! If you are from Indiana, you know that as soon as Memorial Day weekend hits, summer has officially started! This year we hit record heat, which meant lots of time spent outside! My son lives, breathes and probably eats (despite my constant "ca-ca" reminders) the outdoors. The second he gets up, he runs to the back door and says, "Outside?" So of course I have to be a good mama and take him out to play! But considering my child has blond hair and blue eyes (seriously jealous - I pay for mine), nothing is more important that protecting that precious little skin from the hot summer sun! 1. Apply sunscreen to ANY body part exposed to the sun. Since my monkey man won't wear a hat, I'm also sure to even rub it into his little scalp. I'm a huge fan of Coppertone's Waterbabies Foam sunscreen. I can spray it into my hand and see exactly where I'm applying. Plus it's SPF 75 -- remember, the higher the number the better! Don't forget the ears, feet and chubby neck crevices! 3. Apply, Play, Sweat and REAPPLY. Most experts recommend reapplying after 60-80 minutes since your last sunscreen application. If you or your kiddos have been swimming like Michael Phelps or playing hard like a rockstar, definitely reapply before that time frame, especially if the sun is blazing hot! Even though you are playing in water, you can still be dehydrated. Make sure to pack plenty of water or even a few sports drinks when you head to the pool or beach this summer. Take a few "shade breaks" if you're at the park or outside when the weather is hot. Allowing yourself time to cool down is the best way to prevent overheating or dehydration. School's out for summer...in 3 more days. Our beach bag is ready, complete with my Coppertone, and I am literally counting down the minutes until those little yellow school buses drive away from the school for summer vacation. And I think he is too. For more tips or information, check out Coppertone's website! Disclosure: As a member of the Coppertone® Water MOMS group, I receive product samples and promotional items to share and use as I see fit. No monetary compensation has taken place and any opinions expressed by me are honest and reflect my actual experience. I hope everyone is enjoying their Memorial Day! It's a gorgeous day here in Indianapolis - hot but sunny! Here are this week's deals for your tots and babes! --Similac, Gerber or Enfamil Ready to Feed Formula - 2/$11. --Huggies Little Swimmers - $6.49. Use $1.50 off (SS 5/20). Final Price: $4.99. --Pampers super pack diapers - $24.99 and earn $5 ECB. Use $1.50 off Cruisers, Swaddlers or Baby Dry (coupons.com) or $1 off (May PG - expires 5/31). Final Price: as low as $18.49 after ECB. --CVS jumbo pack of diapers or training pants - $6.99 and earn $2 ECB. Final Price $4.99 after ECB. --Pampers wipes (3x refill) - $5.99. Use $0.75 off (coupons.com). Final Price: $5.24. --Fisher Price Rock n Play - $49. Use $7 off Target coupon (target.com) AND $7 off manufacturer (coupons.com). Final Price: $35 -- HOT deal!!! --Huggies box diapers - $19.79. --Select Similac powder - $22.99. --Target Up&Up diapers - $2/2 Jumbo packs (target.com). Final Price: $5.39 each when you buy 2. Here are this week's dollar deals - scroll down to find your store! --Heinz Ketchup-- $1.99. Use the $.50/1 from SS 5/20, which doubles to $1.00. Final Price: $0.99. --Ball Park franks - $0.97. Use $0.75/2 (SS). Final Price: $0.60 each when you buy 2. --Sweet Baby Ray's BBQ Sauce - 5/$5. Use $1/2 (SS 5/20). Final Price: $0.50 each when you buy 2. --Minute Maid Premium Lemonade or Fruit Punch - $0.99. --Barilla Pasta - 5/$5. Use $0.55/2 (SS). Final Price: $0.73 each when you buy 2. --Meijer hot dog or hamburger buns - 5/$5. --Gatorade or Propel Zero - $0.89. --Suave Kids - 3/$5. Use Buy 2 Get 1 Free (RP 5/20). Final Price: $0.89 each when you buy 3. --Suave Professional Shampoo or Conditioner - 3/$5. Use $0.50/2 (RP 5/20) which doubles to $1. Final Price: $0.83 each when you buy 2. --Gatorade or Sobe lifewater - $0.98. --Mars single candy bars - $0.75 and earn $0.75 ECB. Use $0.75/2 Milky Way bars (coupons.com). Final Price: $0.75 and earn $0.75 ECB, so it's FREE after ECB! --Pepsi 2 Liters - $0.99. Use $0.55 off Sierra Mist (RP). Final Price: $0.44. --Colgate 360 Manual toothbrush - $2.99 and earn $2 ECB. Final Price: $0.99 after ECB. --Skintimate shave gel - $2.99 and earn $2 RR. Use $0.55 off coupon (SS). Final Price: $0.44 after RR. --Tecnu First Aid Gel - $7 and earn $7 RR. Final Price: FREE after RR. --Youtheory Collagen Type 1 and 3 - $7 and earn $7 RR. Final Price: FREE after RR. --Colgate Sensitive Pro-Relief or Total Advanced toothpaste - $3.99 and earn $3 RR. Use $0.75 off (SS 5/13). Final Price: $0.24 after RR. --Pure Leaf Tea (59 oz.) -- $1.99. Use the $1/1 from SS 5/13. Final Price: $.99. --Dannon Oikos Cups-- $1.00. Use the BOGO coupon from SS 5/20. Final Price: $.50 each. On my weekly trip to Target tonight, I snagged a great deal on Snuggle fabric softener. This is a 50 load container, so using my Mom's fabric softener saving trick, I should be able to make it last at least 2 months. If you're heading to Walgreens this week, try out these scenarios to grab some HOT deals! --Tecnu First Aid Gel - $7 and earn $7 RR. Final Price: $7 with $7 RR earned. Total for Transaction #1 is $7 with $7 RR remaining. --Irish Spring deodorant or body wash - 2/$6 and earn $3 RR on 2. Use two $0.50 off deodorant or body wash (SS 5/13). Final Price: $5 with $3 RR earned. --Listerine - $3.99 and earn $1 RR. Use $1 off (SS). Final Price: $1.99 after RR. Total for Transaction #2 is $7.38 BUT use your $7 RR from Transaction #1 and you'll pay just $0.38 and have $3 and $1 RR leftover. --Skintimate shave gel - $2.99 and earn $2 RR. Use $0.55 off coupon (SS). Final Price: $2.44 with $2 RR earned. --Colgate Sensitive Pro-Relief or Total Advanced toothpaste - $3.99 and earn $3 RR. Use $0.75 off (SS 5/13). Final Price: $3.24 with $3 RR earned. --Two candy fillers - $0.39 each. Total for Transaction #3 is $6.46 BUT use your $3 and $1 RR from Transaction #2. You'll pay $2.46 and have $2 and $3 RR leftover. Total for all three transactions is $9.84 (before tax) PLUS you'll have $5 RR leftover. Therefore you'll pay around $5 for all three transactions! Don't forget about the 2 day sale too! It's a slow week for ECB, but you can try out these scenarios to snag a few deals at CVS this week! --Colgate 360 Manual toothbrush - $2.99 and earn $2 ECB. Final Price: $2.99 with $2 ECB leftover. Total for Transaction #1 is $2.99 with $2 ECB leftover. --Claritin - $9.99 and earn $2 ECB. Use $5 off (coupons.com or SS 5/20). Final Price: $4.99 with $2 ECB remaining. Total for Transaction #2 is $4.99 BUT use your $2 ECB from Transaction #1. You'll pay $2.99 and have $2 ECB leftover. --Two Milky Way candy bars - $1.50 and earn $0.75 ECB. Use $0.75/2 Milky Way bars (coupons.com). Final Price: $0.75 and earn $0.75 ECB. Total for Transaction #3 is $2.08 BUT use your $2 ECB from Transaction #2 and you'll just just $0.08 and have $0.75 ECB leftover. Total for all three transactions is $6.06 (before tax) BUT you still have $0.75 ECB leftover. Therefore you'll pay around $5.30 for all three transactions! As you can see, it definitely is a slow week with ECB, but you can still grab some great stuff, including Claritin! Unfortunately, if you live in the Indy area like we do, it is blacked out on TV. Redic, I know. But it's still a gorgeous day so I'll hurry through these match-ups so you can get back outside to that pool! --Scott Tissue (12 pk) - $7.49. Use $1 off (SS - expires today!). Final Price:$6.49. --Hershey Kisses - 2/$6. Use $1/2 store coupon and $1/2 (SS 5/20). Final Price: $2 each when you buy 2. --Select Off! Mosquito repellent - $4.99. Use $1 off store coupon and $0.75 off (SS 5/20). Final Price: $3.24. --Off! Clip-On kit - $8.99. Use $1 off store coupon and $2 off (SS 5/20). Final Price: $5.99. --Coppertone products - $9.79. Use $1 off or $3/2 (SS) AND earn $10 RR when you buy 2. Final Price: $3.29 each after RR -- HOT deal! --Skintimate shave gel - $2.99 and earn $2 RR. Use $0.55 off coupon (SS). Final Price: $0.44 after RR -- HOT deal! --Irish Spring deodorant or body wash - 2/$6 and earn $3 RR on 2. Use two $0.50 off deodorant or body wash (SS 5/13). Final Price: $1 each after RR. --Select Advil - 2/$11 and earn $3 RR on two. Use $1 off Advil 20 ct or higher or $1 off Advil PM (RP). Final Price: $3 each after RR. --ThermaCare HeatWraps - 2/$11 and earn $3 RR on 2. Use $1 off (RP). Final Price: $3 each after RR. --Colgate Sensitive Pro-Relief or Total Advanced toothpaste - $3.99 and earn $3 RR. Use $0.75 off (SS 5/13). Final Price: $0.24 after RR -- HOT deal! --Coke products (12 pk) - 3/$9. --Select Doritos or Lays Chips - $1.99. Scenarios to come soon...but I want a couple more minutes of sun time before the baby wakes up! No coupons this week, but that's okay, you can still grab yourself some great deals this week at CVS! Plus, now you have time to organize your binder of uncut and disarrayed coupons that are taking up space in the pockets. --Tide - $5.99. Use $0.25 off Tide (May PG --expires 5/31). Final Price: $5.74. --Gain - $5.99. Use $1 off (RP). Final Price: $4.99. --Honey Maid graham crackers - 2/$5. Use $1/2 (smartsource.com). Final Price: $2 each when you buy 2. --Select Nabisco crackers - 2/$5. Use $1/2 (smartsource.com). Final Price: $2 each when you buy 2. --Crest Pro-Health toothpaste or Glide Floss - 2/$6.98 and earn $2 ECB on 2. Use $0.25/Crest toothpaste or $0.50 off Glide (May PG - expires 5/31). Final Price: as low as $1.99 each after ECB. --Claritin - $9.99 and earn $2 ECB. Use $5 off (coupons.com or SS 5/20). Final Price: $2.99 after ECB -- HOT PRICE! --Glade Sense and Spray - $6. Use $3 off (coupons.com). Final Price: $3 -- HOT PRICE! --Glade Scented oil refill - $4. Use $1 off (coupons.com). Final Price: $3. --Charmin toilet paper (4 pack) - $2.99. Use $0.25 off any Charmin (May PG - expires 5/31). Final Price: $2.74. --Bounty Select-a-Size (2 pack) - $3.99. Use $0.25 off any Bounty (May PG - expires 5/31). Final Price: $3.74. --Off clip-on or Deep Woods Barrier - Buy 1 and earn $2 ECB. Use $2/ Off! Clip-on or $2/2 Off! products or $0.65/ Off! Personal Insect Repellent (SS 5/20). Final Price: varies but your limit is up to 4 on this one! --Twizzlers - 2/$4.98. Use $1/3 (SS 5/20). Final Price: $2.16 each when you buy 3. --Hershey's Drops - 2/$6. Use $1/2 (SS). Final Price: $2.50 each when you buy 2. --Hershey's Bliss bags - 2/$7. Use $1/2 (SS). Final Price: $3 each when you buy 2. Spend $10 on Skinny Cow or Lean Cuisine products and get $3 ECB. --Skinny Cow candy or snacks - 2/$7. Use $1.50/2 (RP). Final Price: $2.25 each when you buy 2. --Lean Cuisines - 2/$6. Use $1/4 (SS). Final Price: $2 each when you buy 4 after ECB. Scenarios to come soon --I'm LOVING this HOT and SUNNY weather! My feet are in the baby pool with my book in hand while the baby sleeps. My cousins had twins and used the Fisher Price Rock n Play for their girls. Then, when I got pregnant, she gave me one for my son too. Seriously - this is the best bassinet and it's around $45. Plus, it's portable, can drag it easily from room to room and it sits at an incline which is great for reflux babies! Print this coupon off now and grab the Rock n Play for a HOT price! Makes a great baby shower gift too! One of my daily trips to Meijer (I think my husband is relieved our new house is at least 10 miles from the closest Meijer), I snagged a HOT deal on baby wipes. Moms, we know that it is ALWAYS a good idea to stock up on these puppies! Use $0.75 off Pampers wipes (coupons.com). Great week to stock up on grilling out things! Here are this week's best match-ups! --Ball Park franks - $0.97. Use $0.75/2 (SS). Final Price: $0.60 each when you buy 2-- stock up price!! --Sweet Baby Ray's BBQ Sauce - 5/$5. Use $1/2 (SS 5/20). Final Price: $0.50 each when you buy 2. -- stock up price!! --Johnsonville brats, links or ropes - $2.99. Use $0.75 off links (SS) or $1 off Premium Sausage (SS). Final Price: as low as $1.99. --Oscar Meyer Selects lunch meat - $2.99 -- Buy 3 get 1 Oscar Meyer Selects hotdog package FREE. Use $1 off OM cold cuts (SS). Final Price: $1.99. --Kraft Singles - 2/$3 -- stock up price!! --Tyson Chicken (bag) - $5.99. Use $0.75 off (SS). Final Price: $5.24. --Kraft Mayo - 2/$6. Use $0.35 off (SS) which doubles to $0.70. Final Price: $2.30. --Kellogg's Cereal - 4/$10 and Get a Free Gallon of Meijer milk when you buy 4. Use $0.70 off Krave mPerk and $0.70 off Kellogg's Crunchy (coupons.com). Final Price: as low as $1.80. --Nabisco Crackers - $1.99. Use $0.50/2 mPerk and $1/2 (smartsource.com). Final Price: $1.24 each when you buy2. --Jamba Juice frozen smoothies - 2/$5. Use $1/2 (SS 5/20). Final Price: $2 each when you buy 2. --Snyder's Pretzels - $1.99. Use $1/2 (SS 5/20). Final Price: $1.49 each when you buy 2. --Meijer hotdog or hamburger buns - 5/$5. --Honey Maid Grahams - $2.79. Use $1/2 (smartsource.com). Final Price: $2.29 each when you buy 2. --Arm and Hammer laundry detergent - $2.99. Use $1/2 (SS). Final Price: $2.49 when you buy 2. --Gain laundry detergent - $9.99. Use $1 off (RP). Final Price: $8.99. --Finish Powerball Tabs or Pacs - $5.99. Use $0.75 off (SS -- expires 5/27!) and $0.50 off mPerk. Final Price: $4.74. --Ziploc bags - 2/$8. Use $1/2 (SS) and $0.75/2 mPerk. Final Price: $3.13 each when you buy 2. --Hot Pocket Snackers - 2/$5. Use two $0.55 off (coupons.com). Final Price: $1.95 each when you buy 2. --Country Crock buttery spread - 2/$6. Use $1 off (coupons.com). Final Price: $2. --Irish Springs body wash - 2/$6. Use $0.50 off (SS 5/13) which doubles to $1. Final Price: $2. Any other great finds will be posted! Hello Friends! It's a pretty good week at Marsh too! I am crossing my fingers for a Triple Coupon promo this weekend! Just in case, I have my binder all cleaned out and organized. Here is this weeks steals and deals . . . . Final Price: $1.50 <----stock up! Final Price: $1.00 <-----stock up! Use the $1.00/2 from RP 5/6 ?? Final Price: $1.16 each <----stock up! Final Price: $.99 <----stock up! Happy Marshing and Hoping for a Triple Coupon Weekend! I LOVE this promotion and it's BACK!! Normally, every time you scan your Kroger Shopper's card you earn 1 point for every dollar you spend on that shopping trip. When you earn 100 points, you receive $.10 off a gallon at the Kroger gas stations. If you check your receipt, the bottom part will tell you what you earned on that trip and what you have saved up. 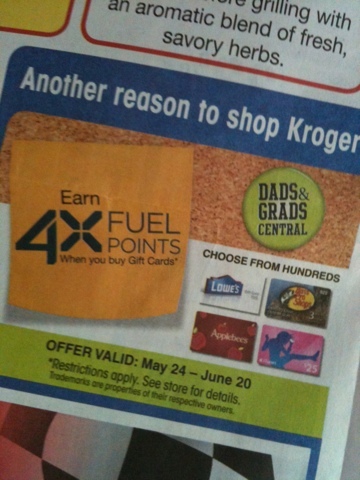 Well, from NOW until June 20th, you can earn 4X the point every time you purchase a GIFT CARD from Kroger. They have hundreds of gift cards to choose from. For example, if you purchase a $20 Starbucks gift card during this promo, you will earn 80 gas points! We all know the price of gas isn't going to get much better anytime soon, so why don't you buy gift cards for the places you shop on a regular basis and save money on gas at the same time! It's also a great way to keep you on budget. I have a problem spending mucho dinero at Target. When I have a $20 gift card, I know that I don't want to go over my $20 limit! We finally a few good deals at Kroger this week! Final Price: $1.25 each <---stock up! Final Price: $1.99 <-----stock up! Happy Memorial Day Weekend! Remember those who fight for this country and honor them everyday. You know that amazeball invention that has saved my mornings at least 5 minutes? Yes, every minute I can sleep in counts. Well check out this HOT coupon for $5/2 boxes of Cafe Express K-Cups. Seriously print this if you have a Keurig because coupons for K-Cups are rare my friends. I've already print two -- mmmm. Time to buy mommy (as in yourself) some new shoes! I love me some ice cream (and so does my son and husband)! So I'll definitely be printing this coupon off to stock up for the summer! P.S. With Memorial Day just about here, this kind of stuff usually runs on sale -- so with this coupon you may get it super cheap! Sign up now to get AmericanBaby magazine FREE! We had a great turnout for the giveaway! But now you're dying to see who won, right? Send us an email with your contact information - you have 48 hours! Thanks again for the love! We have an new exciting giveaway that will be appealing to your little one's mouth coming soon! Here are this week's best deals for your tots and babes! --Buy 2 Huggies big boxes, Get a $5 Meijer gift card. --Select Gerber snacks or meals - 4/$7. --CVS diapers, formula or wipes - Buy 1 Get 1 50% off. --Huggies jumbo packs - $8.99. Use $2 of Pull-Ups (SS 5/20). Final Price: $6.99. --Huggies wipes -$5.99 (3 ct). Use $0.50 off (SS 5/20). Final Price: $5.49. --Circo boys' rash guards or swim trunks - $9-$10 each. --All Up&Up baby food - 10% off. --Huggies or Pampers jumbo packs - 2/$18. 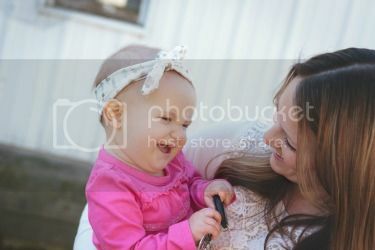 Use $1.50 off Pampers (coupons.com). Final Price: $7.50 each. Check out your store below for some HOT dollar deals! --Select Pepsi 2 Liters - 6/$6. Use $0.55 off any Siera Mist (SS). Final Price: $0.45. --Pure Protein bar - 10/$10. Use $1/2 (coupons.com). Final Price: $0.50 each when you buy 2. --Martinelli's Apple Juice - 10/$10. --Van Camp's Pork and Beans - $0.39. --Goldfish Crackers - $0.99 -- stock up price! --Fuze or Snapple Tea - $0.85. --Lay's Stacks or Full Throttle drinks - $0.99. --Vitamin Water - 5/$5. Use Buy 5 Get 1 Free mPerk. Final Price: $0.83 each when you buy 6. --Country Crock buttery spread- 2/$3. Use $1 off (coupons.com - no longer available). Final Price: $0.50. --Eckrich Meat or franks or Armour LunchMakers - 5/$5. --Sierra Mist 2 liter - $1.25. Use $0.55 off (RP). Final Price: $0.70. --Hefty plates - 2/$3. Use $1/2 (SS 5/13). Final Price: $1 each when you buy 2. --KC Masterpiece BBQ sauce - 2/$3. Use $1/2 off (SS 5/13). Final Price: $1 each -- stock up price!! --French's Yellow Mustard - $1.49. Use $0.30 off (SS 5/13) which doubles to $0.60. Final Price: $0.89. --Frank's Red Hot Sauce - $1.49. Use $0.35 (SS 5/13) which doubles to $0.70. Final Price: $0.79. --Kraft Pasta Salads - $0.99. --Ortega's Taco Seasoning - $0.59. Use $0.50/2 Ortega Products (SS) which doubles to $1. Final Price: $0.09 each -- stock up price!! --Smartwater, Vitaminwater, Powerade, Honest Tea or Fuse - 4/$5 and earn $1 ECB on 2. Final Price: $1 each when you buy 4 after ECB. --Pepsi 2 Liters - $0.99. --DenTek floss picks - $2.50 and earn $1.50 ECB. Final Price: $1 after ECB. --VO5 - $0.89. Use $1/3 (SS 5/15). Final Price: $0.57 each when you buy 3. --Salonpas-Hot capsicum patch (1 ct) - $1.87 and earn $1.87 ECB. Final Price: FREE after ECB. --Suave Naturals or Kids - 2/$3. Use B2G1 Free (RP 5/20). Final Price: $1 each when you buy 3. --Nestle candy bars - $0.49 -- great fillers this week! Use $0.60/3 (SS 4/29). Final Price: $0.29 each when you buy 3. --Brut or Sure deodorant - 2/$4. Use $1 off Brut product (SS 5/13). Final Price: $1.00. --Oasis Age Essential Mouthwash - $5.99 and get $5 RR. Final Price: $0.99 after RR. --Select Colgate toothpastes - 2/$6 and earn $3 RR on two. Use $0.75 off (SS 5/13). Final Price: $0.75 each when you buy 2 after RR. --U by Kotex tampons - $3.99 and get $3 RR. Final Price: $0.99 after RR. --Sleep Sheets Strips - $4.99 and get $4.99 RR. Final Price: FREE after RR. That's a pretty good list this week, wouldn't you agree? Not many sales changed from last week! In fact, I had to check the date on the ad to make sure I didn't have last weeks. But here are some match-ups and deals you can score! --Doritos or Ruffles - $1.99. --General Mills Cereals - $1.99. Use $1/3 (SS 5/20). Final Price: $1.66 each when you buy 3. --Capri Suns - $1.89. Use $1/3 (SS). Final Price: $1.56 each when you buy 3. -- Ragu Pasta Sauce - $1.27. --Tyson Chicken Nuggets - $4.59. Use $0.75 off (SS). Final Price: $3.84. --Tide - $5.49. Use $1 off (MD PG). Final Price: $4.49. The great thing about that sale is Kroger donates $1 to the USO when you buy 10 participating products -- so you save and Kroger helps make a difference. Love it. Like I said earlier, it's a slower week at Walgreens. But you can still grab some great stuff this week with the scenarios below! --Sleep Sheets Strips - $4.99 and get $4.99 RR. Final Price: $4.99 with $4.99 RR leftover. Total for Transaction #1 is $4.99 with $4.99 RR leftover. --Oasis Age Essential Mouthwash - $5.99 and get $5 RR. Final Price: $5.99 with $5 RR leftover. Total for Transaction #1 is $5.99 with $5 RR leftover BUT use your $4.99 RR from Transaction #1 and you'll pay $1 and have $5 RR leftover. --Select Colgate toothpastes - 2/$6 and earn $3 RR on two. Use two $0.75 off (SS 5/13). Final Price: $4.50 with $3 RR leftover. --Three Nestle candy bars - $0.49 each. Use $0.60/3 (SS 4/29). Final Price: $0.87. Total for Transaction #3 is $5.37 BUT use your $5 RR from Transaction #2 and you'll pay just $0.37 and have $3 RR leftover. Total for all three transactions is $6.36 (before tax) and you'll have $3 RR leftover. So you will have paid around $4 for all of this stuff --- holla!!! Yahooooo! I love great deals like these! This is a great week to stock up on lotions, deodorants and body washes at CVS! Try these scenarios out to grab some fabulous goodies! --Irish Spring deodorant or body wash or bar soap - 2/$7 and earn $4 ECB. Use two $0.50 off deodorant or body wash/bar soaps (SS 5/20). Final Price: $6 with $4 ECB leftover. Total for Transaction #1 is $6 with $4 RR leftover. --Two Suave lotion - $3. Use B1G1 Free lotion (RP 5/20). Final Price: $3.00. --Suave Naturals or Kids - 2/$3. Use B2G1 Free (RP 5/20). Final Price: $3.00. Total for Transaction #2 is $7.00 BUT use your $4 ECB from Transaction #1. You'll pay $3.00 and have $4 ECB leftover. --Salonpas-Hot capsicum patch (1 ct) - $1.87 and earn $1.87 ECB. Final Price: $1.87 with $1.87 ECB leftover. --DenTek floss picks - $2.50 and earn $1.50 ECB. Final Price: $2.50 with $1.50 ECB leftover. Total for Transaction #3 is $4.37 BUT use your $4 ECB from Transaction #2 and you'll pay just $0.37 and have $3.47 ECB leftover. Total for all three transactions is $9.37 (before tax) with $3.37 ECB leftover. Therefore you'll pay around $6 for all of this amazeballs stuff! Not a bad week my friends, not a bad week. Slower week at Walgreens, but that's okay since last week was fab! --Blue Bell Ice Cream - $4.29 -- this stuff is THE BOMB!!! --Hellman's mayo - $3.00. Use $1 off coupon (SS 5/20). Final Price: $2.00. --Huggies Little Swimmers - $6.99. Use $2 store coupon and $1.50 off (SS 5/20). Final Price: $3.49 -- stock it up! --Gilette Fusion ProGlide Razor - $9.99 and earn $4 RR. Final Price: $5.99 after RR. Thanks for your patience fellow couponing friends! :) Scenarios to follow shortly! Busy weekend folks, but here are this week's match-ups for CVS! --Pepsi 12 packs - 3/$10 and earn $2 ECB. Use $0.55 off Diet Pepsi or $0.55 off Sierra Mist (SS). Final Price: $2.17 each when you buy 3. --Pantene Shampoo or Conditioner - 2/$6.97 and earn $1 ECB. Use B1G1 free (May PG) or $3/2 (MD PG). Final Price: as low as $1.49 each when you buy 2 after ECB. --Irish Spring deodorant or body wash or bar soap - 2/$7 and earn $4 ECB. Use two $0.50 off deodorant or bodywash/bar soaps (SS 5/20). Final Price: $1.50 each when you buy 2 after ECB. --Secret deodorant - 2/$5. Use $1 off (May PG). Final Price: $1.50. --Purex liquid or UltraPacks - 2/$5. Use $0.50 off (RP). Final Price: $2.00. --Coppertone Sun Care - $8.99 and earn $3 ECB. Use $1 off (SS 5/20) or coupons.com. Final Price: $4.99 after ECB -- great deal! --All Revlon Nail - $4.99 and earn $3 ECB. Final Price: $1.99 after ECB. --Crest ProHealth - 2/$7.98 and earn $2 ECB on 2. Use $0.25 off rinse or toothpaste (May PG). Final Price: $2.74 each when you buy 2 after ECB. --Vaseline lotion - $5.99 and earn $1 ECB. Use $0.50 off (SS 5/20). Final Price $4.49 after ECB. --Caress body wash - $3. Use $0.75 off (SS 5/20). Final Price: $2.25. -Suave lotion - $3. Use B1G1 Free lotion (RP 5/20). Final Price: $1.50 each when you buy 2. -Suave Professionals shampoo, conditioner, styler or body wash - $4. Use $0.50 off styler or $0.50/2 shampoo or conditioner (RP 5/20). Final Price: as low as $1.50. -Suave Keratin Infusion Smoothing shampoo or conditioner - 2/$6. Use $0.50 off styler or $0.50/2 shampoo or conditioner (RP 5/20). Final Price: $2.50. -Suave Naturals or Kids - 2/$3. Use B2G1 Free (RP 5/20). Final Price: $1 each when you buy 3. There are a ton of items that qualify for a $10 gas card when you spend $30. I'll make that a separate post tonight.